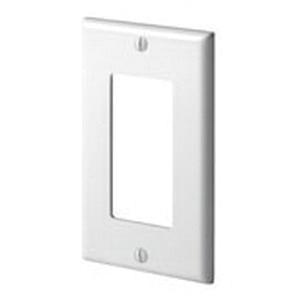 Leviton Standard size 1-Gang decora/GFCI wallplate/faceplate in white color, has sturdy thermoset construction and smooth finish. It measures 4.5-Inch x 2.75-Inch x 0.255-Inch. Rectangular wallplate/faceplate has smooth face and rounded edges that resist dust accumulation. It comes with color matched mounting screws. This sleek wallplate/faceplate brings subtle elegance to any home. It provides great coverage and hides unsightly wall surface irregularities. Tamper-resistant wallplate is suitable for heavy usage and co-ordinates perfectly with paint or wall coverings. It offers vertical orientation and device mounting. Wallplate/faceplate is UL listed and CSA certified.